I just finished using my 8 inch Delta jointer, edge jointing a half dozen boards. The jointer’s 4 inch dust port was hooked up to my new cyclone dust collector for the first time. Here’s a picture of what didn’t end up in the dust collector. Is this normal for a jointer? The dust collector works great with the table saw. I’m thinking that the design of the jointer cutterhead doesn’t facilitate great dust collection. But I have no reference point to compare to. Opinions needed. Thanks in advance. I have a similar jointer and get the same results. The dust collection on those tools just doesn’t seem to work well however it also doesn’t seem like it kicks a lot into the air so clean up is ok by pulling off the hose for a quick clean up. From the picture’s dust path it looks like dust is shooting at the board from the cutterhead. If you could get more suction or move the port closer under the cutterhead you will cut down on that dust. You could also simply add overhead dust collection. You probably have too much air coming in from underneath the tables. Any air leaks will greatly reduce the dust collectors full potential. You might try putting some kind of flexible cover under the tables to block out the air. The tables need to be adjustable with the covers in place. My dust collector picks at least 97% all of the dust and chips from the jointer and planer. I was reall surprised at the amount of dust in your photo, my 8” General jointer doesn’t spit virtually any dust out. Is your dust collection connected at the opposite end? On the other hand, I have the same Unisaw and find DC doesn’t perform the way I expected it to on that machine. Is there something blocking access to the dust collector perhaps? I don’t think it should expell that much dust or shavings. Looks about the same amount as what I get on my 6” jointer. Marty, your DJ-20 is in need of a suction tune-up. My DJ-20 and most all others needed the same thing. For starters, the dust chute within your base is only three sided – there is no top to it. To fix this issue you shoulds remove the front and rear base cabinet covers by loosening the bottom three screws and removing the top three screws on each side. Unless you already have some, go to the blue or orange box and buy a small roll of 12” wide (or something close to 12”) aluminum flashing in the roofing department. Bend a channel the width of the chute and with approx. 1”, 90 degree legs. Pop rivit this chute top in place – job done. Secondly, you need to check the perforated chip deflector mounted directly below the cutterhead. If I remember right, you have to unbolt your jointer from the base cabinet and flip it on its side. Unless this problem has been corrected in the last 10 years, the perforated chip deflector may have been mounted backwards, thereby inhibiting chip removal rather than facilitating it. Good luck, and let us know how you make out. With all this information in hand, I’m convinced that it’s not working like it should. I removed the front cover (as suggested by Halfday) and noticed a bunch of sawdust packed against the cutterhead. I think this happened because I’ve been using the jointer before I had a dust collector, and the chips were getting jammed. I was able to reach my hand up the chute and clear the ‘dust-jam’. I powered up the dust collector, turned on the jointer, and jointed some wood. I’m not seeing any (I’m sure that there’s a tiny bit somewhere) sawdust now. Hallelujah! When I get a chance I’ll fully enclose the chute per Halfday’s suggestion. Thanks again everyone. You made my day! 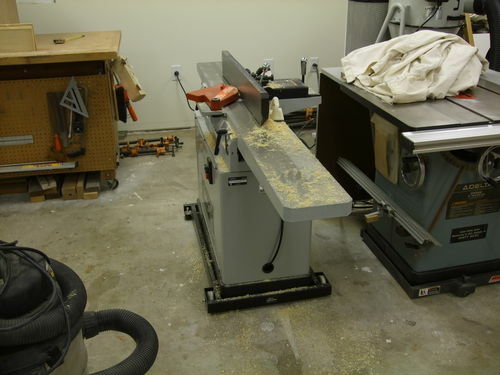 FWIW – I quickly found out that I should not use my jointer (Grizzly G0604X) without the DC hooked up and running. The chute clogs up quickly and then you start throwing a lot of chips out the top (where else are they to go?). With the DC connected, I get very few chips on top. Marty—I had similar problem with my Grizzly … there was a gap between the top of the dust chute in the base and the casting under the cutter head where chips and shreds would collect, eventually clogging the chute. It was pain to do (thank God I have small hands! ), but I was able to remedy it by covering the gap with metal tape like the HVAC guys use to seal ductwork. After that, no more clogging.